Denise Lester, MD, a board-certified anesthesiologist and pain management physician at the Hunter-Holmes-McGuire VA Medical Center in Richmond, Virginia recently spoke with us about research they are conducting regarding their efforts to treat pain without opioids. “The Hunter-Holmes-McGuire VA Medical Center is taking a comprehensive approach to pain management. “We’re looking at what we can do to reduce or hopefully eliminate the use of opioids”. Our VIP (Veterans Integrative Pain) center offers several complementary pain management therapies such as Acupuncture, Biofeedback, Music Therapy, Mindfulness Meditation and Anti-Inflammatory Diet. We also offer a variety of injections as well as a state-of-the-art systems to implant peripheral nerve electrical stimulating catheters (peripheral nerve stimulators). Using this system peripheral nerves are stimulated using low levels of electricity delivered through a very small (300 micron) implanted wire, or “lead” for pain control. Neuromodulation pain management therapies have been used for decades to stimulate structures in the deep brain and the spinal cord. Earlier peripheral nerve stimulation (PNS) systems were first evaluated in the 1960’s but until recently they required a very invasive neurosurgical procedure. We now have access to significantly less invasive devices that can be implanted through the skin (percutaneously) using a small needle making use of PNS much more reasonable early in the treatment continuum. Our facility has evaluated and championed many different types of pain management therapies as we endeavor to combat the opioid crisis. Our goal for our patients is to minimize the need for them to return to the hospital for their pain care. For example, we would like to see their effects of our injections lasting at least three months while providing at least a fifty percent reduction in pain. 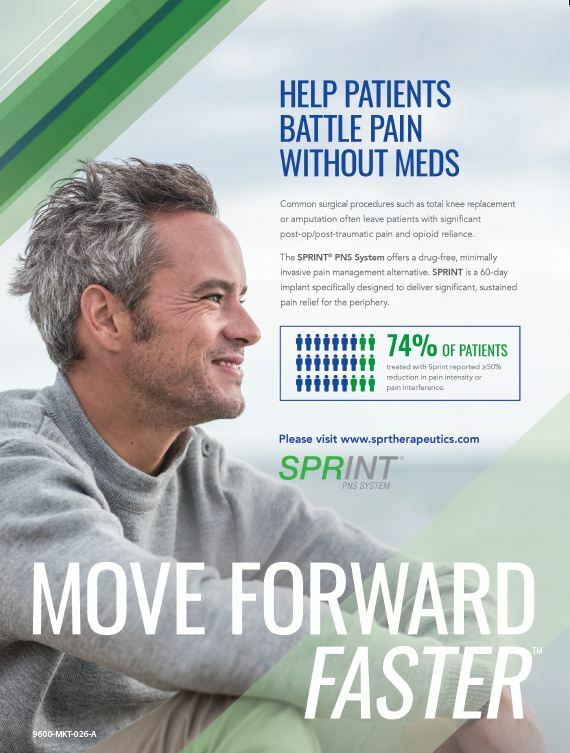 Our peripheral nerve stimulation patients are implanted with a lead that is connected to wearable device before being withdrawn up to sixty days later. Most patients have pain relief that is sustained long after the lead has been withdrawn, in many cases up to a year or longer. Some neurostimulation systems are permanently implanted and are designed to stay in the body for the life of the patient. In most cases, the patient doesn’t have to return to the pain clinic to receive further care. The VA recently spearheaded an initiative to foster physician involvement in research in which they made fifty-thousand dollar research grants available to six physicians whose applications were accepted as having high-potential. I was awarded this grant last year.. I had been primarily in clinical care for the twenty-one years I've been with the VA. Additionally I had always held an interest in research to assist our veterans in pain. The project we submitted in the application for the pilot grant involved a pilot study to evaluate the effect of stimulating the femoral and sciatic nerves of the legs for up to 60 days in patients who have recently undergone an amputation. In this project we wanted to assess whether percutaneous peripheral nerve stimulation (PNS) could reduce acute post-amputation pain and opioid use while also assessing whether it could prevent chronic pain including phantom pain and stump pain. These pain states are both very difficult to treat once they present themselves. We've been enrolling patients since October of 2017 and are very satisfied with the results thus far. We’re very hopeful that this will lead us in the direction of helping many other Veterans. It was clear from prior studies that percutaneous PNS helped patients with chronic pain, but our study is evaluating how providing the therapy perioperatively may prevent pain from becoming chronic or disabling. This study is the first-of-its kind to assess the potential to prevent chronic pain in amputations patients with peripheral nerve stimulation at time of amputation.. In our study, PNS is initiated at five to seven days post-operatively and after their continuous peripheral nerve block catheter has been removed.